Brian Michael McCann (born February 20, 1984) is an American professional baseball catcher for the New York Yankees of Major League Baseball (MLB). He played for the Atlanta Braves from 2005 through 2013. McCann is a seven-time All-Star and a five-time Silver Slugger Award winner. 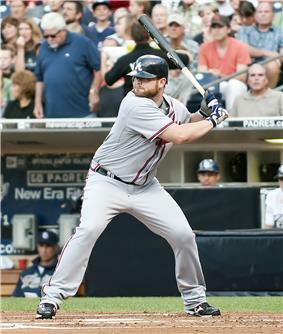 McCann made his Major League Baseball debut with the Atlanta Braves on June 10, 2005. A personal catcher for John Smoltz for most of the 2005 season, McCann hit his first home run in just his second regular-season game and became the first Braves player in franchise history to hit a home run in his first playoff at-bat on October 6, 2005. He accomplished the feat in the second inning of a 7–1 victory over Roger Clemens and the Houston Astros in Game 2 of the 2005 National League Division Series. McCann was named the everyday starter when the Braves traded Johnny Estrada to the Diamondbacks. During the 2006 season, McCann hit .333 with 24 homers and 94 RBI. He led all Major League catchers in homers, and his RBI total was matched only by Victor Martinez. The Braves rewarded McCann by buying out his arbitration years with a 6-year, $27.8 million contract during spring training in 2007. On November 23, 2013, McCann agreed to a five year, $85 million contract with the New York Yankees, with a vesting option for a sixth year. The Yankees officially announced the deal on December 3. McCann will wear the number 34 as number 16 is retired in honor of Whitey Ford. On May 28, 2014, with limited options at first base, manager Joe Girardi slotted McCann into his first career start at first against the St. Louis Cardinals going 2-4 with one RBI, a run scored, and a walk in a 7-4 Yankee win. On September 28, 2014, McCann entered the game against the Boston Red Sox as a pinch runner for Derek Jeter, after Jeter's final career hit. Brian McCann's father Howie coached at Marshall University and currently runs Windward Baseball Academy. His older brother, Brad, played in the minor league systems of the Florida Marlins and Kansas City Royals before retiring after the 2007 season. McCann married Ashley Jarusinski in December 2007. Former teen-idol and favorite of the McCanns, Donny Osmond, performed at the wedding. Their first child, Colt Michael, was born in July 2012. Their second child, a daughter who was named Colbie, was born in September 2013. He resides in Lawrenceville, Georgia. ^ a b Bowman, Mark (March 22, 2007). "McCann's the man for Braves". ^ a b "Brian McCann Statistics and History". Baseball-Reference.com. Retrieved November 3, 2011. ^ By Mark Bowman / MLB.com (January 1, 2011). "McCann to play at Triple-A on Thursday | MLB.com: News". Mlb.mlb.com. Retrieved November 3, 2011. ^ MLB Player Fielding Stats – As c – 2009," ''ESPN'', accessed October 6, 2009""". Espn.go.com. Retrieved November 3, 2011. ^ "McCann's three-run double gives NL first All-Star win since 1996". ESPN. July 13, 2010. Retrieved July 14, 2010. ^ Kepner, Tyler (July 13, 2010). "National League Ends All-Star Loss Streak". New York Times. Retrieved July 14, 2010. ^ 8:41 pm May 18, 2011, by David O'Brien (May 18, 2011). "McCann credits older brother’s hitting tip | Atlanta Braves". Blogs.ajc.com. Retrieved November 3, 2011. ^ "2011 Major League Baseball Fielding Leaders". Baseball-Reference.com. Retrieved November 3, 2011. 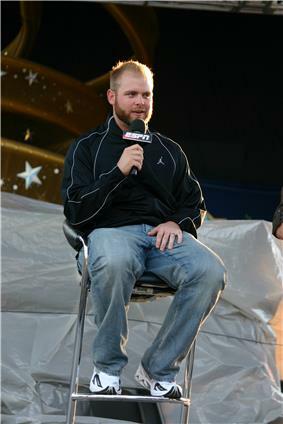 ^ "Should Braves buyout Brian McCann?". http://throughthefencebaseball.com. ^ Simon, Andrew (November 23, 2013). "McCann, Yanks reportedly agree to five-year deal". MLB.com. Retrieved November 23, 2013. ^ "On paternity leave, McCann a first-time father". Atlanta.braves.mlb.com. Retrieved November 23, 2013. ^ "Braves resting some regulars". www.ajc.com. September 22, 2013. Retrieved November 23, 2013.